Hope everyone will come across this scenario when trying to access some elements in a web application on your mobile device/desktop and not being able to find certain elements because of an overlapping image or text, here comes Visual testing. Your functional test case might get passed but it gets failed in visual testing and the visual errors will have a severe impact on user traffic to your application. Visual testing not just make sure that your application looks good but it also detects differentiation between baseline images and screenshots taken during testing. Visual regression testing is a way of comparing screenshots of the site with the baseline screenshots. These screenshots are often taken before and after you update your front-end code during code deployment. As the name suggests, the objective of visual testing is to find visual errors. The errors like misalignment of objects, font, layout and rendering issues. We can achieve the visual regression testing using webdriver.io. Download and Install node.js – https://nodejs.org/en/ – download the stable version and select based on your windows version. Set up the selenium web driver. Download the stable version of selenium jar from http://seleniumhq.org/ page. Go to https://sites.google.com/a/chromium.org/chromedriver/downloads and download the chrome driver and place it inside the selenium jar folder and set the path in the environment variable. Once all the files downloaded run the npm test command. A question interface pops up(Attached the screenshot for your reference). It will help to create the config file easy and fast also add the Visual-regression service in it. Add the below code at the top of your wdio.conf file. Add the below code under service section in your conf file. Create folder ./test/specs in Wdio-visual-regression-service folder. Create your first test and past it in specs folder. The Default reporter will be the dot. If you need any additional reports, refer the reporter section http://webdriver.io/guide/reporters/dot.html and install the required reporters based on your needs and configure in wdio.conf.js. 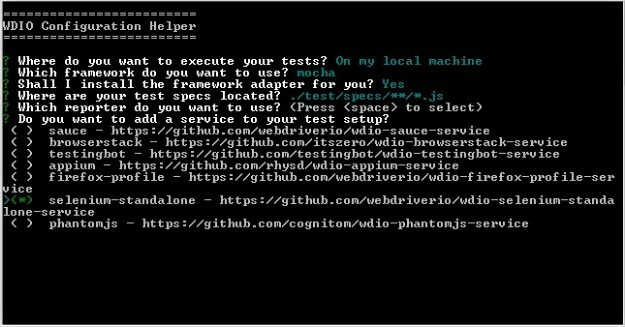 Now your script will start getting executed and this will create the baseline screenshots for your test now change the URL of your code to http://webdriver.io/contribute.html and run the code once again. The below snapshot shows the command lined dot report output. The Junit.xml report can be imported into excel. The below snapshot shows the imported report. The implementation of Visual regression testing by using webdriver.io in QA cycle will decrease the manual UI regression testing time and cost. Spending time on implementing the automated visual UI testing in your releases will give you good test coverage and excellent ROI. Kannathasan is a Certified Tester (Foundation level ). He loves testing eCommerce applications and ferreting out hidden bugs. Likes solving challenging puzzles during his free time.